Perhaps the greatest challenge for the radical left today is to articulate a politics that decisively breaks with the disastrous experiences of many 20th century socialisms. This is a difficult task that requires self-reflection, active questioning, and openness to new expressions of struggle by the always complex and fluid global working-classes. Making this task even the more difficult is that neoliberalism has destroyed or co-opted traditional forms of working-class organization over the last thirty years. This has resulted in the expansion of the logic of capital to every corner of the world. As the ‘great recession’ that began in 2008 demonstrates, capitalism is more global than ever. In each case, communities and workers self-organized and fought with their own hands and feet, rejecting vanguardist approaches of the old left, which often turned into an intellectual-political elite supposedly liberating the masses from above. In addition, many of these movements sought to prefigure new social relations while struggling against the present ones, organizing themselves on the principles of participatory democracy, and horizontalism. ‘Strong leaders make a weak people,’ Emiliano Zapata’s famous principle, popularized by the Zapatistas in the 1990s, perhaps best captured this political moment. By the late 1990s, many of these movements had lost steam, and their demands became channeled into the electoral arena, bringing to office several new left and center-left governments. Soon, most of Latin America would be swept by this so-called ‘pink tide.’ This phenomenon sparked a renewed hope within many sectors of the left that insisted capturing state power was central to the process of social transformation. No doubt, some of these new governments made important strides forward. However, over 10 years later, some have begun to question the reform – and in some cases revolutionary – potential of many of these new left governments, including those of Venezuela and Bolivia. A reinvigorated right wing that has been fiercely fighting back needs to be included in these assessments. In some cases, they have been organizing secessionist movements, and in the case of Honduras a successful coup was orchestrated with the help of American imperialism. The right has also won elections, most notably in Chile where the government of Sebastián Piñera has become one of the leading neoliberal administrations in the region, at least for now. After 17 months of relative quiet, the Piñera government now faces its first major challenge and one of the biggest mass movements in recent Latin American history. It is one that has brought both students and workers to the streets – sometimes called the ‘Chilean winter’ – since May. Importantly, this is also a crucial challenge for the new Chilean left that is being created as we write. This consists of an attempt to build a movement from below that is neither co-opted by the bourgeois state, nor simply ignores it. Walking the tightrope between these two avenues is precisely what students and workers in Chile are struggling with as they build for the next set of demonstrations. For the last 30 years, the principal function of the Chilean educational system has been to expand the accumulation of capital. This has been done through the deepening of the educational model first developed by the dictatorial regime of Augusto Pinochet, a task the post-Pinochet governments of La Concertacion were happy to carry out. Central to this model was the transfer of fiscal responsibility for elementary and secondary education to the municipal level, while providing subsidies to private schools. Recognizing the unpopularity of this model, the current neoliberal right wing government led by the billionaire, Sebastián Piñera, sought to reform the system by increasing the privatization of elementary and secondary education. At the post-secondary level, the government has allowed a steady increase in tuitions. Currently, students in Chile pay an average tuition of 300,000 pesos ($630) per month, making this one of the most expensive post-secondary education in the world (particularly relative to income levels). Not surprisingly, privatization has opened the door to transnational capitalists, particularly banks who have been more than happy to provide students with ample debt loads to finance their studies. In addition, the post-secondary system is highly class divided. Working-class students receive a second-rate education at the elementary and secondary level and at underfunded public universities where they are taught to be followers and prepared for a routine life of unskilled, low-wage and precarious employment, if not unemployment. In contrast, upper-class students attend private schools and universities where they are socialized to internalize the prevailing values of free markets and individual success with the hope of one day obtaining a management position at a large corporation. This education system reinforces one of the most unequal Latin American societies. In fact, 10 per cent of Chileans have average income larger than those of Norway, while the income of the poor 10 per cent is equal to those in Ivory Coast. In addition, between 2006 and 2009, the level of poverty increased from 13.5 to 15 per cent, even as social spending was increased significantly by the social democratic administration of Michelle Bachelet. Importantly, all this is happening despite high levels of annual growth in Chile, indeed the highest in Latin America. Not surprisingly, the education system expresses this broader political and economic reality. Today, 83 per cent of the students attending the public municipal schools live in a household in which the average monthly income is less than 180,000 pesos ($330), but two out of three students attending paid school were supported by an average family income of 1,526,000 pesos ($2,700). In 2004, 64 per cent of the highest scores in the standardized university admissions tests came from students enrolled in the paid secondary schools. However, 93.2 per cent of students attending municipal high schools failed to obtain grades high enough to be accepted to traditional universities. Not surprisingly, only 10-20 per cent of young Chileans belonging to the poorest 40 per cent economic strata are currently enrolled in post-secondary education. Neoliberal education in Chile has led to growing consciousness among secondary and university students that the entire educational system needs to be radically changed in favour of a more inclusive and democratic public one. The first signs of this growing unrest occurred in 2006, during the secondary student rebellions against the neoliberal education law originally dictated by Pinochet, and maintained by the Concertación governments. The students demanded education be considered a right, not a commodity, and an end to the subsidiary role of the state in its provision and delivery. To this end, five hundred thousand students organized a general strike that combined street mobilizations and high school seizures, shaking the Bachelet government. Eventually the movement faded, as its leadership became trapped in negotiations with the government. Nevertheless, the students forced the Bachelet administration to recognize the crisis in education was real, as well as the deeply authoritarian character of the education laws inherited from the military. In 2011, the second phase of the movement got underway. This occurred in the context of growing social mobilization by different sectors of the Chilean working-class struggling against low wages, labour flexibilization, the firing of civil servants and mining development. In addition, people angrily voiced their opposition to the construction of coal-fired thermal power plants that threaten their health and the environment. Notably, on January 11th, in the southern province of Magallanes, communities declared a civil strike to protest the abrupt rise of gas prices by 16.7 per cent, as decreed by the Piñera government. On this opportunity, twenty four social organizations created the ‘Magallanes’ Citizens Assembly’ which took direct control of the main cities, blocking highways, building urban barricades, even declaring a curfew on vehicles and demanding the government to annul the price increase. For seven days, the Assembly operated independent of political parties, and was able to mobilize 30,000 people on a daily basis, asserting itself as the real government in Magallanes. This forced the Piñera government to reduce the price hike to 3 per cent and increase gas subsides for poor families. Adding to the momentum, on May 12th secondary and university students called a national day of protest against the poor quality of the education system. They took the streets on the main Chilean cities from Northern Arica to the Southern Punta Arenas. The mobilization received the support of the Central Union of Workers (CUT), the National Teachers Union, the main university student federations, and the Public Servant National Association. In Santiago alone, 30,000 demonstrators voiced their demands: an end to ‘market education,’ reductions of student debts, increased funds for public universities, and the democratization of educational institutions. It has been estimated that more than 100,000 students and supporters across the country participated in this day of protest. Camila Vallejo, President of the University Students Confederation. Tired of waiting for a meaningful response by the government, the students proceeded to call a national strike for June 30th. The mobilizations on this day showed high levels of militancy, as secondary students in Santiago seized more than 100 high schools. In the capital alone, more than 100,000 people took to the streets while another hundred thousand did the same in the rest of the country. It quickly became clear that the movement’s political consciousness was growing. 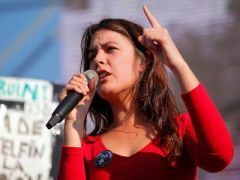 For example, when government officials asserted that there simply were not enough funds to meet the student’s demands, Camila Vallejo, President of the University of Chile Student Federation and President of the University Students Confederation (and also an activist of the Juventudes Comunistas de Chile), responded by saying that if transnational corporations are stopped from stealing the country’s natural resources, the government would have enough money to finance not only free public education for all, but also free healthcare. ‘Our future is not for sale,’ one of the movement’s key slogans, began to resonate with the protests on the streets. The student movement reached its first victory when Piñera was forced to change his education minister, Joaquín Lavín, a former junior minister in the governments of Pinochet and member of the Opus Dei, whose personal popularity had declined to just 8 per cent. Lavín was supposed to be the next presidential candidate of the right wing alliance presently in office. Another victory for the student movement was the growing support from broad sectors of the population. Parents, teachers, and copper miners openly expressed their support, recognizing that all their grievances against the neoliberal regime were being expressed in the student strike. However, the government responded quickly by threatening to declare an early winter break to the school year, and even its possible cancellation. In addition, the corporate media began its demonization campaign against the students, using isolated incidents of violence conducted by ‘los encapuchados’ (the ‘black bloc’) to delegitimize the whole movement. Responding to these attacks, Camila Vallejo asserted that, although these violent provocateurs do not represent the collectively agreed tactics of the student movement, their actions are driven by their marginalization from the system and their rage should be understood as a reaction to their future-less position at the bottom of the neoliberal ladder. At the same time, she added, government infiltration within some of these groups cannot be ruled out. Indeed, adding to the suspicion, about one hundred ‘encapuchados’ were found attempting to torch the central offices of the National Teachers Union, a staunch ally of the student movement. On August 9th and 18th, gigantic demonstrations took place in Santiago and in the main Chilean cities. Between 150,000 and 200,000 marched in the capital to express their support for the student’s decision that dialogue with the government was not possible until it accepted the main elements of their proposal. Families with small children, artists, teachers and workers expressed their commitment to be part of this democratic movement that demands a democratic society and the end of 30 years of neoliberalism in the country. Even elite private secondary high school students joined the movement. 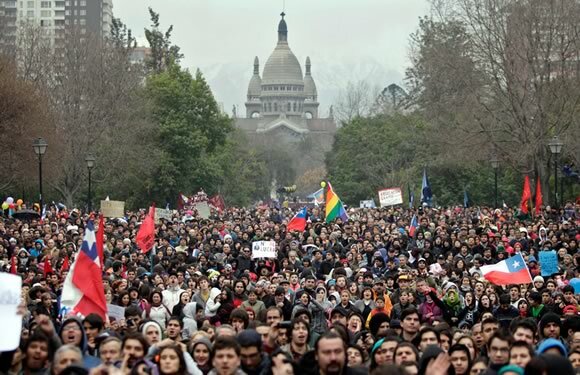 It was estimated that out of the 4 million students in Chile, 500,000 are actively participating in the struggle. However, it is clear that many layers of society are also actively involved. For example, the movement’s call for people to show their solidarity by banging pots at night has been taken up by entire neighborhoods who have mobilized to public squares, streets and highways, bringing memories of the anti-Pinochet struggle in the 1980s. Further proof of the movement’s wide appeal was evident during a meeting held by ‘families for education’ on August 21st in Santiago’s main central park. The meeting attracted 1 million people in support of the student’s demands. The CUT demanded a new labour code, an end to precarious jobs, better salaries, healthcare reform, and a publicly controlled pension system. The demonstrations were the largest yet, bringing together 600,000 people across the country. The strike affected 15 Chilean regions and 90 cities. Despite heavy police repression and mass arrests, the organizers of the demonstrations called the events a great success and promised further actions if their demands were not met. The students have also intensified their demands, and now are openly calling for a constituent assembly to change the constitution. Reflecting on these events, it is important to highlight the movement’s level of self-organization and dismay for pre-established elite political institutions. Symbolic of this is the student’s re-working of the historic chant, ‘El pueblo unido jamás sera vencido,’ now modified to, ‘El pueblo unido avanza sin partidos’ (‘The people united move forward without parties’). In addition, during the mobilizations, students occupied the headquarters of both right wing and socialist parties. Finally, consistent with the deeply democratic and participatory character of the movement, students debate and discuss through assemblies, and the leadership remains closely aligned with the demands of the base. As one news report on Telesur summed it up: “The youth trust only their own power.” The sentiment seems widespread. Reliable surveys now show the popularity of Piñera, his government, and all major parties at an all-time low. Not surprisingly, students have rejected the calls for dialogue made by parliamentarians from La Concertacion, as well as the reform proposals presented by the current Minister of Education. On this opportunity, the students reiterated their demand for a radically different educational system that is linked to an alternative development model based on the recuperation of national resources and tax reform. This story would not be complete without also highlighting the remarkable level of tactical creativity in the student movement. For example, as a response to the government’s declaration of early holidays, the students took to the streets in bathing suits and snorkel equipment, that is, in the middle of winter! The student movement turned whole sections of cities into surrealist carnivals that even the mainstream media could not resist. A quick search on YouTube produces fantastic homemade videos documenting some of the students’ most memorable performances, including ‘el gagazo,’ a dance-a-thon to the music of Lady Gaga in the capital’s central square, ‘el besaton,’ a mass kissing marathon, and flash mobs of mock suicides. It is clear from the above that the Chilean student movement has become a major development for the left not only in Chile, but in Latin America as a whole. The students are presenting one of the leading neoliberal administrations in the region with a major political challenge. Crucially, they have managed to do so by building their own power outside of pre-established political institutions. Importantly, the movement has done so without simply avoiding the state, but rather through direct confrontation with it, and with a demand for its transformation and democratization. At a time when the electoral road to social transformation in the region appears blocked, this development holds much potential. Another danger is that even if the movement topples the Piñera administration, it is possible it might get co-opted by the neoliberal Concertacion, or the still very much top-down approach of the Chilean Communist Party. Finally, and perhaps most worrisome, are the recent public statements made by government officials alluding that, as in the early 1970s, violent repression may be the only solution to continued mobilizations. In conclusion, it is worth noting the parallels between the Chilean students and the indignados explosion against poverty and unemployment that has struck the streets and squares of London, Madrid, Belfast, Athens and Barcelona. Like these other insurgencies, the Chilean movement is youth-led. In addition, they all come as a reaction to the dynamics of the greatest global economic crisis since the Great Depression. It is clear that the movement in Chile ‘has more legs.’ Indeed, young activists are now creating new radical organizations. It is therefore crucial that leftists in Canada and around the world engage in active international solidarity by organizing forums, solidarity trips, discussion groups, and so forth. For the historical left in Chile (the Communist Party, Christian Left, Humanist Party, MAS and Allendistas Socialists), and for the new left that is emerging, the task is to support this rebellious movement, connecting present struggles with past ones, and taking the lead from the energy and creativity of all those who fight ‘from below’ for new political means to exit from capitalism. Manuel Larrabure and Carlos Torchia study and teach at York University, and are involved in Latin American solidarity work. This article originally appeared in The Bullet, an e-bulletin published by the Socialist Project.